The blades, the blades. – Dirty wet dog , boats and sailing. I have a problem with the rudder blade. Basically it was a bit loose in the cheeks…which sounds like something we should deal with in my department at work…..but seriously on the boat it makes the steering a bit wobbly especially when i am trying to make the boat self-steer with just a line over the tiller : as the blade shifts very slightly from side to side (it actually self rotates a little) its impossible to settle the steering at one angle. I thought at first just to shim and pack between the blade and the cheeks but then also noticed some fine cracking around the holes that take the uphaul and downhaul lines so i figured to take the whole thing home , sand the whole thing down, chase the cracks out and ‘make good’. 2 days later……………………………………i am having to strip the whole thing back to bare timber so that is layers of antifoul, primer, some filler in parts and then a layer that i don’t know what it is but that is universally moist underneath : as i scrape and chip a small piece off the wood is ever-so slightly damp underneath but only in the surface fibres and has a very odd smell. i honestly don’t know what that final layer is, its a semi-clear coating as a hard and thin film, could be polyester resin i’m not sure, definitely not epo as the whole thing was done pre-west system. Whatever its all got to come off and its a painfully tedious task. The sander won’t really touch it and the only tool that will is my battery powered grinder with a soft sanding disk used very carefully. The battery only gives me about 20 minutes of grinding time and i reckon it will take another 3 or 4 hours on the tool to get this coating off. Plan then will be to dry the blade totally and then coat it with glass/epoxy and re-fair it…..oh and then cure the slop ! 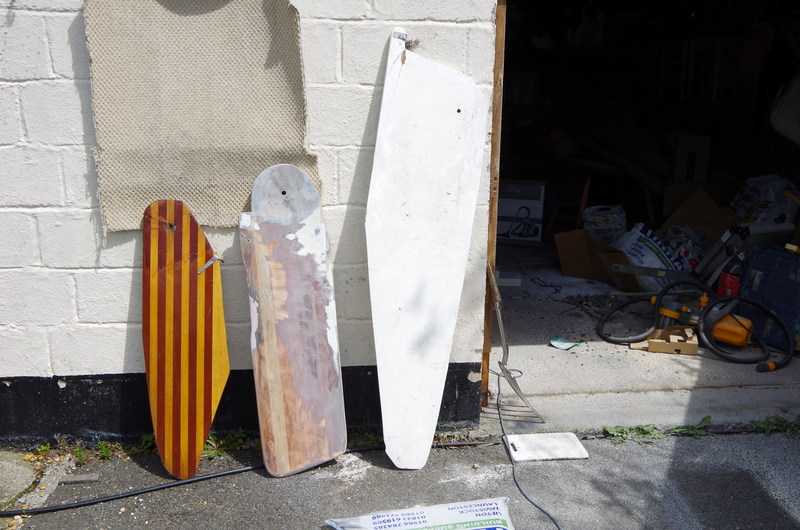 I did briefly consider utilising a big dinghy blade that i have laying around instead or taking a template and building an entirely new blade with a slightly better shape. Edit : a few more hours later into the job. When i get down to whatever that coating is and chip some off there is moisture underneath although i’m less convinced now that its water, there is an odd smell like stale urine so maybe something with a urea content ?. one face is now drying in the sun having got to the point where what is left on is solid and i can start on the other face. My plan now is to run a sheet of glass down each side and then do an over-wrap down the leading edge and then refit with some thin washers as well….extra cloth and resin will bring the thickness up a bit. Previous Honey i bought a caravan ! Sounds like polyester, its probably got the beginnings of boat pox its the styrene you can smell. Its not a styrene smell, more like urea. Anyway as of tonight all the loose stuff is off and back to bare clean wood, blade was out in the sun and breeze all day and i glassed one side with some 200gm cloth and poxy.